Is your lawn looking a bit tired? Does it get compacted regularly by kids playing, heavy equipment or vehicles? Don’t want to spend $200/day renting a lawn aerator? 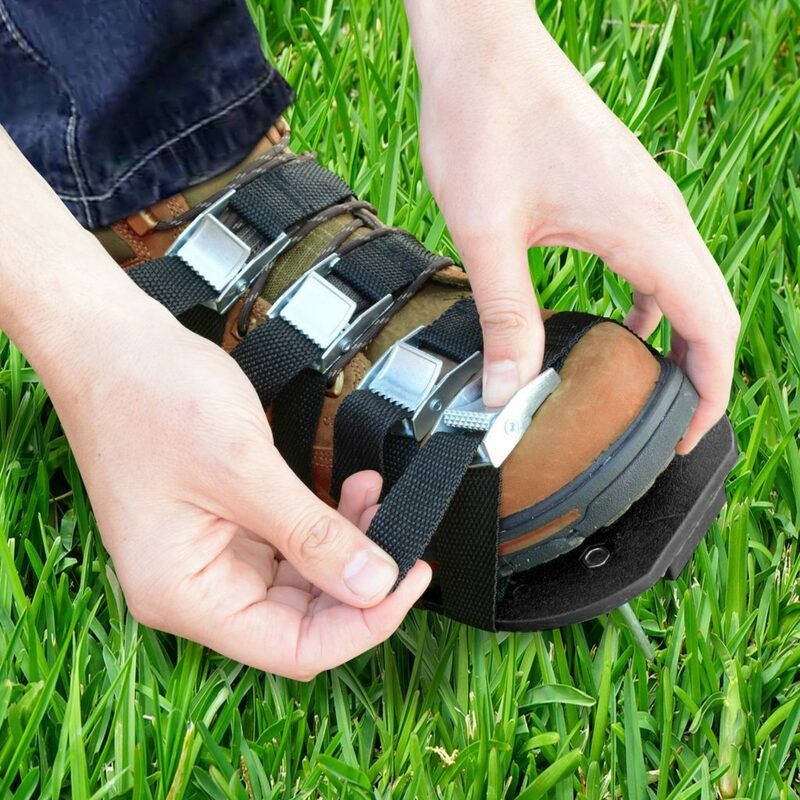 Maybe a pair of Lawn Aerator Sandals will do the trick – simply strap them on to your regular shoes. Use them while you’re mowing the lawn, you’ll get an extra workout and your lawn will be able to breathe again. Bayer Advanced suggest an easy test is to push a screwdriver or pencil into the lawn. If this is difficult, it suggests the lawn needs aerated. If you want, you can confirm this by trying to dig up a square foot of turf. If the shovel blade easily sinks into the turf, you don’t need to aerate. However, we generally follow the mantra “if in doubt, aerate”. It’s not going to do any harm, and the extra oxygen, nitrogen and water to the roots of the lawn will be beneficial. The sandals will arrive completely disassembled. You will need to manually attach the straps and the 13 spikes to each sandal. What Are the Differences Between Sandals? Metal spikes that protrude through the sole to penetrate the lawn. The main differences between models are in the quality and type of materials, and the number of attaching straps. Almost all the models on the market now come with 13 2”-long spikes per sandal. In our opinion, the Gardenite Nylon Lawn Aerator Sandals are the best option out there. To be honest there’s not a lot to choose between the different models price-wise – they’re all within a few dollars either side of $20. 4 straps instead of the 3 or 2 found on most competitors (like all of the sandals available, you have to assemble them yourself, so when you’re putting them together you can choose to use 3 straps if you like, the 4th strap just gives you more options). Until recently, Lawn Aerator Sandals usually came with 2 straps, which didn’t really allow secure attachment to your shoes. Amusingly, most of the manufacturers now say how superior their sandals are to their 2-strap opposition, even though 2-strap sandals are now very rare…. Customer reviews suggest that Gardenite take their money back guarantee very seriously, and go out of their way to help if there is any problem. The nylon sole is stiffer than the thermoplastic of the competitors – though this should make these sandals longer-lived, they do feel stiffer underfoot, which some find uncomfortable. Assembly is a bit fiddly & awkward, especially if (like me) your fingers aren’t exactly small and dainty. This is an issue almost all Lawn Aerator Sandals suffer from. They can only aerate a small area at a time, so you will take a long time to cover larger lawns with them. If you have a large lawn, you may need to invest in renting or buying a conventional roller-style aerator. Alternatively, you may find it better to focus on the high-traffic areas, rather than trying to aerate the entire lawn. Most of the features of the Gardenite sandals are offered by one or more of the competition. We simply feel the Gardenite model offers the best combination of features and quality for the money. The main differences are the plastic sole instead of the harder-wearing nylon of the Gardenites, and 3 straps instead of the 4 the Gardenite comes with. 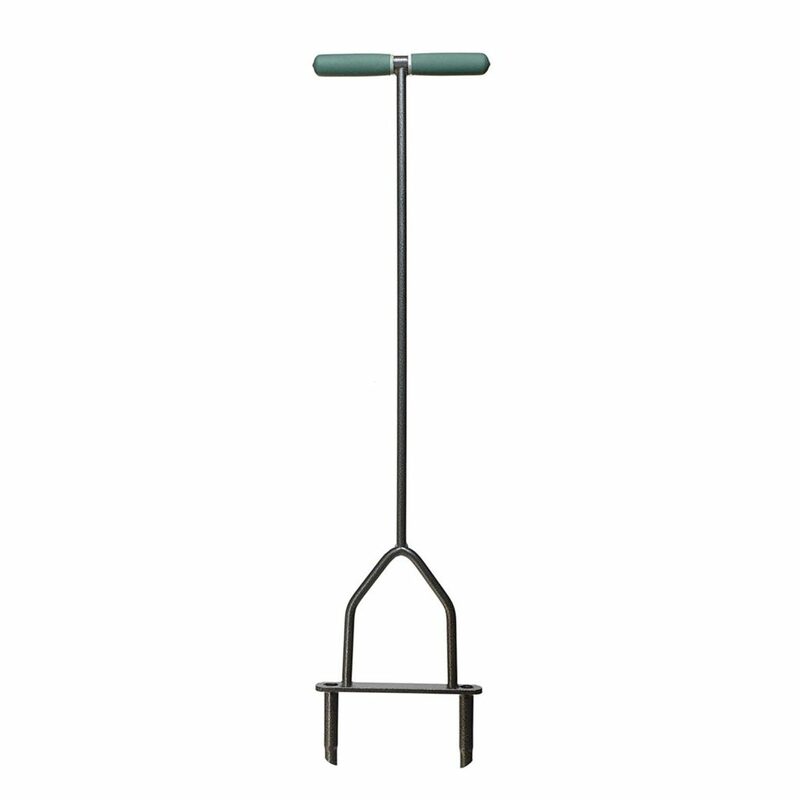 If you feel the stiffness of the Gardenites will be a problem, we recommend the NiG model. They come fully assembled (except for the optional 4th strap, which is included in the box, but you have to install it yourself if you choose to use it). Apart from being delivered assembled, there’s not much difference between this and the other offerings in the market. If you can get these sandals for a similar price to our top choice above, they may be worth considering. For a larger area or a more difficult job, you would likely hire (or employ somebody with) a rotating plug aerator, which takes a larger core of soil out, to further improve the air & water flow to the roots of the lawn. These are generally large, heavy, and expensive. There are manually operated roller-type aerators (using a spike as the lawn aerator sandals do, rather than a plug), such as this one. 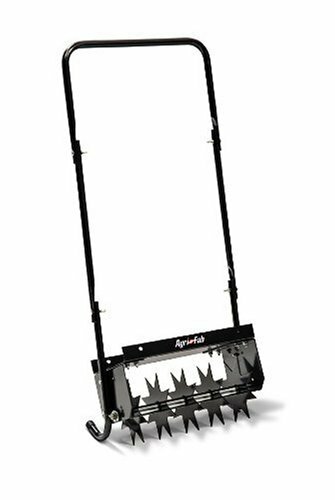 If you don’t mind a bit (or a lot) of back-breaking labor, you could consider a manual coring aerator such as this Yard Butler model. The advantage is the larger core, rather than the smaller hole made by a spiked aerator. The main disadvantage is the amount of time and effort it would take to cover anything but the smallest of lawns. After every use, wait for the sandals to dry, then clean the soles with a stiff brush. Take care to avoid injuring yourself on the sharp spikes. Inspect all the spikes for tightness and damage every time. 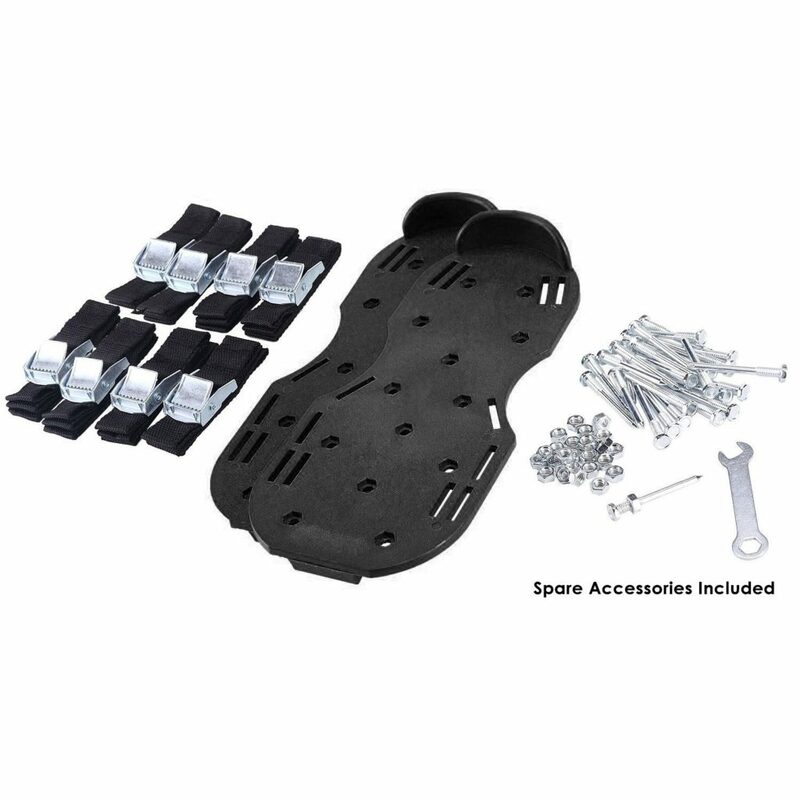 Replace any missing or damaged spikes before using the sandals again. Store them in a cool, dry place, away from direct sunlight. If you follow these tips you should get many seasons of use from your aerator sandals. Do Lawn Aerator Sandals Really Work? Opinions are mixed about the effectiveness of the sandals. There’s an amusing tale here of one man’s struggle, both with lawn aerator sandals and with the scruffiness of his lawn compared to those of his neighbours. Another (old) review suggests that many of the “experts” who say this type of aeration is completely ineffective are wrong. The suggestion is their opinions may be colored by need to sell the products they carry and recommend. 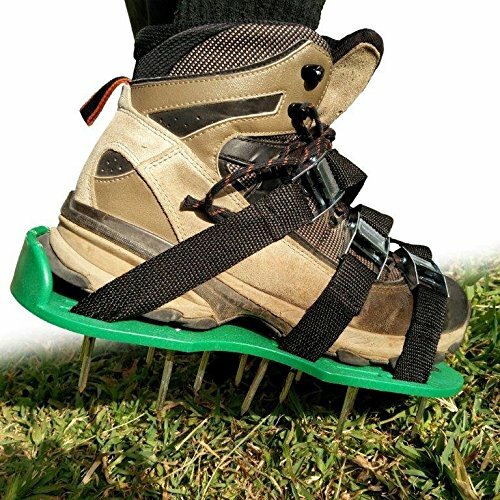 Lawn Aerator Sandals are not going to be a complete replacement for traditional aerators in every situation. The best way to aerate your lawn is to remove small plugs or cores from the soil, this is what the commercial devices do. Lawn Sandals don’t remove a plug, they just force a hole into the ground. They will help deliver more oxygen to the roots of the lawn, but it is unfair to expect a device you can buy for around $20 to compete with one you can rent for a day for $200! At Outdoor Ideas, we have found them to be effective on small areas of lawn which have previously been stubbornly bare, no matter how much water & fertiliser we threw at them. At around $20, you don’t have much to lose if they don’t work for you. 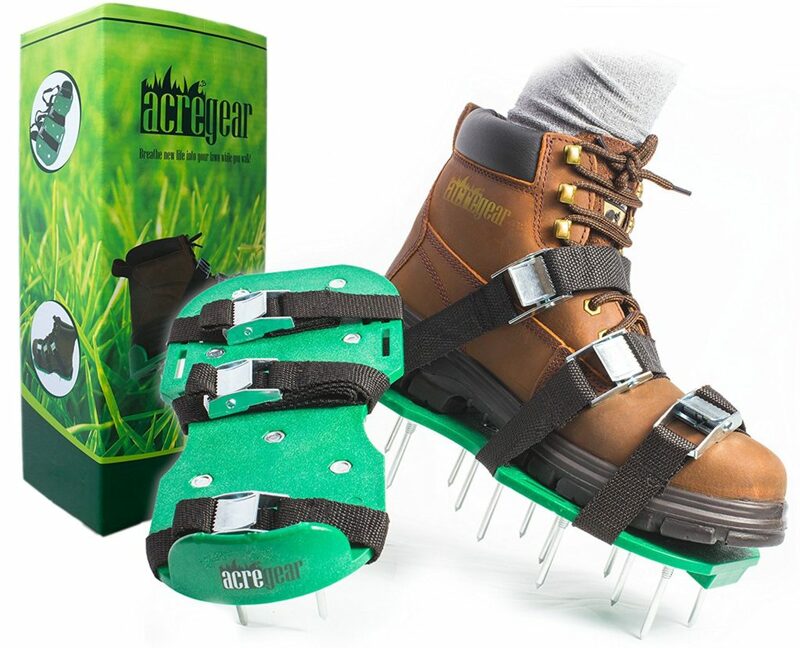 What do you think of your lawn aerator sandals? Let us know in the comments below.